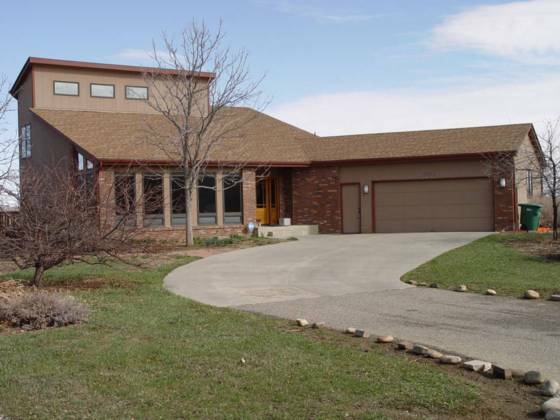 Located down a country lane lies this magnificent 2-story contemporary style home with curved driveway, mature landscaping and fantastic farm and foothill views. Open and spacious kitchen with solid surface countertops, maple cabinetry and wood flooring. Master suite with a luxurious 4 piece bath with oversized shower and built-in cabinetry. Living room with gas fireplace with tile surround. Sunroom with tile flooring and full wall of glass. Large dining area. Main floor utility. Full unfinished basement for future expansion. 2-car oversized garage with work area. Central air conditioning and sprinkler system. And dont forget to take a stroll on the flagstone walking path and enjoy the sunset from your 23 x 18 deck.